The ability for players to specify their own winning conditions is one of the unique and innovative aspects of Careers, resulting in play experiences and strategies that vary from game to game. At the start of the game, players create a secret “personal success formula”, a simple mathematical equation that reflects their desired pursuit of fame (number of stars), fortune (in thousands of dollars), happiness (number of hearts), or a combination of all three. The only restriction on the quest for success is that each player’s formula must total 60 points (E.g., 25 Happiness points + 15 Fame points + 20 Money points.) This arbitrary number results in a typical game lasting 45-60 minutes. Players score points by moving along the main board and into one or more of 8 available career paths. The first player to meet or exceed their success formula wins the game. 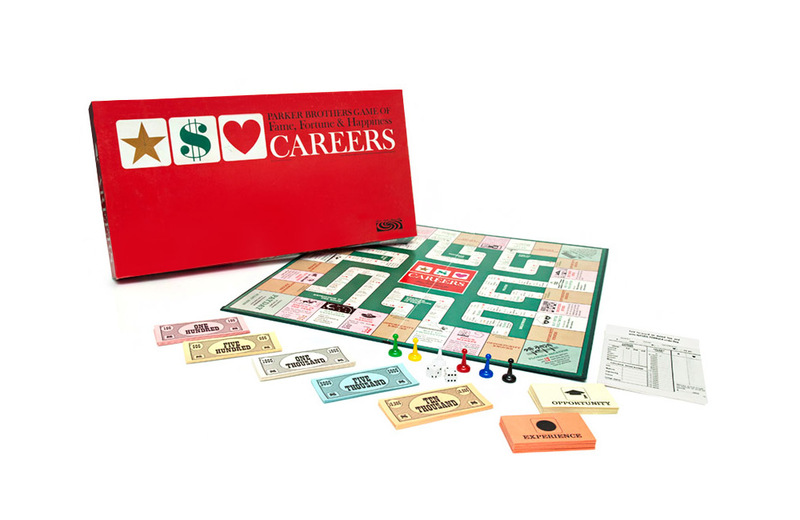 Over its 50-year shelf life, Careers has been released in several versions. In each, the available career options have been updated to reflect changing vocational interests of the time. The original version of the game featured occupations in Big Business, College Degree, Politics, Expedition to the Moon, Hollywood, Going to Sea, Farming, and Uranium Prospecting (no, that isn’t a typo!). In the 1970s, the last three of those careers were replaced by Ecology, Teaching, and Sports. Careers was initially developed and self-published by sociologist Dr. James Cooke Brown. The game was his homage to showing people that being successful in life can take many forms, but Brown was primarily an author of science-fiction and creator of an artificial language called Loglan.